It seems like at least once a week I have to dig through my file cabinet or go in search of my wallet for an online purchase, to fill out a direct deposit form or to call my bank. While I know where to find all of the information I need for each of our accounts, it’s not all in one convenient place, and I waste time and energy getting it. There’s also the fact that because I handle 90% of our finances, my husband is at an even bigger disadvantage, and if something happened to me, I’m afraid he’d waste a whole lot of time trying to find basic information. 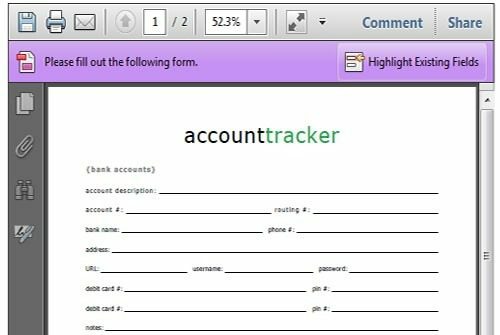 This account tracker allows you to keep track of all of the important information for your bank accounts and credit cards (you could also include a Paypal account under the bank account section if you use yours regularly). Click here download or print the free account tracker today.